Product #18614 | SKU V-LCD71MD | 0.0 (no ratings yet) Thanks for your rating! The V-LCD71MD 7" 1080p Camera-Top Monitor from Marshall Electronics offers a high 700 cd/m2 brightness and 1920 x 1080 display with adjustable LED backlight. It supports input resolutions up to 1080p, and features a modular design which lets you expand your inputs and outputs via optional modules. 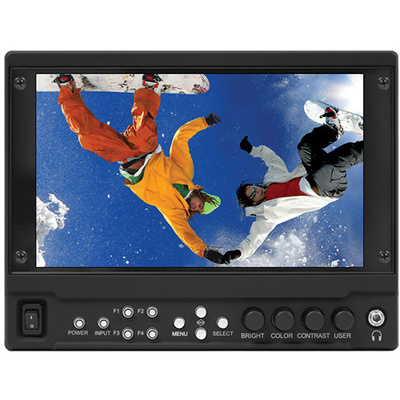 The monitor offers durable front panel function buttons, a polycarbonate screen protector, and comes packed with professional features to assist in focusing, framing, and exposing your shots, including DSLR ratio adjustment with four presets, adjustable IRE clip guide, waveform, false colours, peaking, and a variable pixel-to-pixel function. A battery base plate comes included, which lets you attach one of Marshall's optional battery adapters, available for a wide range of camcorder, DSLR, or V-Mount batteries. Also included is a 12 V, 2A power supply. This features lets you scale your DSLR video output, fill the screen, and eliminate black pillar bars with a variety of options to choose from. This is particularly useful for some Canon DSLR cameras. Choose between Normal, 3:2, 16:9, and Full-Screen. The feature can be programmed to one of the front panel's four function buttons for quick and easy access. The V-LCD71MD incorporates both a waveform display and stereo audio bars. These may be displayed separately or together in any one of the four corners of the monitor. The stereo audio is de-embedded from either the HDMI input (8 channels) or from the optional 3G/HD/SD-SDI input (16 channels). Any pair of the available channels may be selected for both the display and the headphone output. The Zebra function (Clip Guide) is used to visually filter data on the screen that is under a lower threshold or over an upper threshold. Data on either side of the filters can be displayed with a custom colour. The zebra function can also be inverted to filter the area between the upper and lower threshold. The colour selected for the lower threshold acts as the colour for all inverted zebra data. The false colour filter is used to aid in the setting of camera exposure. As the exposure is adjusted, elements of the image will change colour based on the luminance or brightness values. This enables proper exposure to be achieved without the use of costly, complicated external test equipment. The peaking filter is used to aid the camera operator or assistant with obtaining proper focus. When activated, the internal processor will display a coloured highlight on the screen where sharp edges appear. When the focus is pulled, different parts of the image will have these coloured highlights. This indicates that this portion of the image is sharp or in focus. The filter keeps the original colour of your scene, but adds a choice of four colours—red, green, yellow, or pink—to choose from for the highlights, as well as adjustable sensitivity for fine-tuned control. Six user-setting presets allow the user to save six system configuration files for later recall when needed. These configuration files will save 38 different parameters that can be adjusted by the user.